The author of the critically acclaimed Wife 22 has written a captivating novel about a love that transcends time—perfect for readers of The Time Traveler’s Wife, Time and Again, and the novels of Alice Hoffman. San Francisco, 1975. A single mother, Lux Lysander is overwhelmed, underpaid, and living on the edge of an emotional precipice. When her adored five-year-old son goes away to visit his grandparents, Lux takes a solo trip to Sonoma Valley—a chance to both lose herself and find herself again. Awakened at midnight, Lux steps outside to see a fog settled over the Sonoma landscape. Wandering toward a point of light in the distance, she emerges into a meadow on a sunny day. There she meets a group of people whose sweetly simple clothing, speech, and manners almost make them seem as if they are from another time. And then she realizes they are. Lux has stumbled upon an idyllic community cut off not only from the rest of the world but from time itself. The residents of Greengage tell a stunned and disoriented Lux that they’ve somehow been marooned in the early twentieth century. Now that she has inexplicably stepped into the past, it is not long before Lux is drawn in by its peace and beauty. Unlike the people of Greengage, Lux discovers that she is able to come and go. And over the years, Lux finds herself increasingly torn between her two lives. Her beloved son is very much a child of the modern world, but she feels continually pulled back to the only place she has ever truly felt at home. 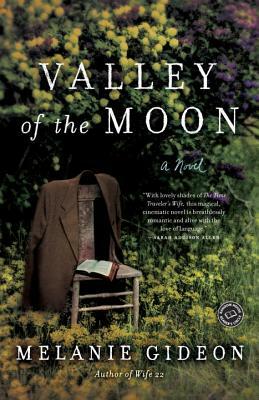 A gorgeous, original, and deeply moving novel about love and longing and the power that time holds over all of us, Valley of the Moon is unforgettable. Melanie Gideon is the bestselling author of Wife 22 and The Slippery Year: A Meditation on Happily Ever After, as well as three young adult novels. Wife 22 has been translated into thirty-one languages and is currently in development with Working Title Films. She has written for The New York Times, San Francisco Chronicle, Shape, Marie Claire, The Times of London, and other publications. She was born and raised in Rhode Island and now lives in the Bay Area with her husband and son.